This Saturday don’t miss this rare chance to witness a rare show by 3 of the planet’s most advanced turntablists! Support comes from myself & my brother Dj Daredevil, as well as an exclusive showcase performance by UK turntablist duo Grandeurs of Delusion performing tracks from their all-scratched LP ‘Night Of The Flavigator’. 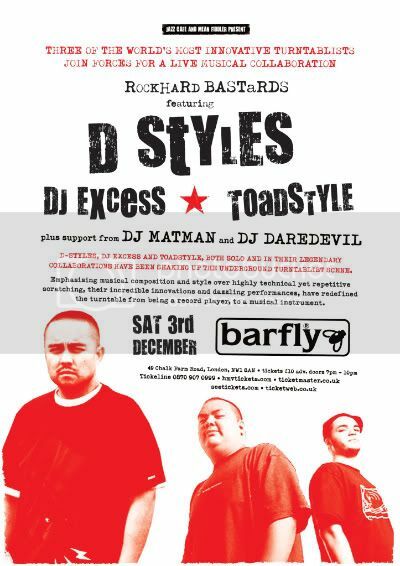 D-Styles, DJ Excess and Toadstyle, both solo and in their legendary collaborations between themselves and with others as Ned Hoddings, Gunkhole and Beatjunkies have been shaking up the underground turntablist scene. Emphasising musical composition and style over highly technical yet repetitive scratching, their incredible innovations and dazzling performances, have redefined the turntable from being a record player, to a musical instrument. Refusing to adhere to musical boundaries and blurring the lines between straight sampled and scratched, there lives manage to join the dots between free jazz, funk and hiphop with the low-end developments that resonate with the UK’s bass music scene. Check out & ‘attend’ the Facebook event here. Next: This Friday: The Xmas Throwdown.. 7"s all night! !